We never did raid Tony’s stash, but when I was asked if I wanted to review Sunday Scaries CBD Gummies, I was like, “Heck yes I do.” I’m a person who struggles mightily with anxiety, and who does not sleep well, and also who is at the gym 6-7 days a week (yes) not because I’m especially virtuous or hard-bodied, but because it helps me manage my anxiety and tendency to want to auto-defenestrate at basically all times, and therefore am in a constant state of aching. I’ve been told that CBD can help with all of those things, so I signed right up for a work-sponsored experiment. Spoiler: I was pretty impressed with my Sunday Scaries CBD Gummies experience. But you’ll have questions about the specifics! I have answers. I needn’t have worried. They don’t taste bad at all! The top notes are definitely those of Standard Issue Gummy Bears until … they aren’t. There’s a kind of bitter, kind of medicinal aftertaste which you might think I’d cite as a negative, as this is a review in which I’m weighing the relative merits against the ways in which the product disappointed, but actually I was glad for the less-than-pleasant aftertaste because it took away my anxiety about accidentally glutton-ing out and eating them all in one sitting. 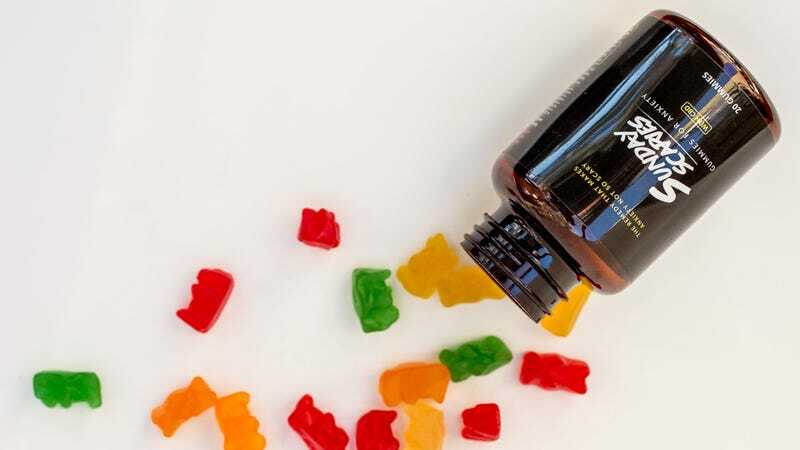 Sunday Scaries retail for $39 for a bottle of 20 gummies (in both regular and vegan forms), or $1.95 per gummy, with discounts available for buying in bulk. Which is a little steep, especially when you take into account that the company advises you to experiment with the dosing by starting with 1-3 gummies and seeing where that leaves you, effect-wise. Also, because this is for sure the question I’d want answered if I was reading this review, I went ahead and counted out the gummies by flavor: The bottle I got contained 7 red (obviously the best), 5 yellow, 4 orange, and 4 green (can we outlaw green gummies?) So! I give Sunday Scaries high marks for providing an abundant number of the red ones. For my experiment, I ate one (red) gummy about 45 minutes before bedtime, waited about 30 minutes to see how relatively chilled out I was feeling, and then popped a second (red) one. Two gummies seemed to be the right dose for me, though I suspect the second gummy is serving more of a placebo effect than anything else. Okay But How Do They, You Know, Work? They work WELL. Well, wait, let me tell you about the one effect I was hoping they would have but didn’t: They didn’t do much for the aches and pains I suffer from because I insist on over-exercising. Oh well! Here’s what they did do for me — they chilled me out without sapping my energy or making me feel sluggish when I was facing a daunting job that was physical, mental and emotional in equal parts. A task that had the potential to send me into a spiral of feeling totally overwhelmed went just fine because I was notably calmer than I am in my usual resting state. The other big, noticeable, very welcome effect was that they helped me sleep better. I took my bottle of gummies along with me when I was traveling (to perform the aforementioned anxiety-inducing task) and I will FOR SURE continue to pack them for trips. I sleep badly under the best of circumstances, but when I’m on the road it’s especially hard for me to get to sleep, and I find that I wake up more times in the middle of the night than I normally do. I popped gummies before bed the two nights I was away, and I had a lot less trouble getting and staying asleep than I have in ages. Even if it was due to a placebo effect, which I really don’t think it was, I would gladly pay $2 a pop just for the comfort of not stressing about whether I was going to be able to sleep or not. What Are Your Favorite CBD Gummies?